Tom Gentile is widely known as America’s #1 Pattern Trader thanks to his nearly 30 years of experience spotting lucrative patterns in researching options trading. Now, he’s harnessed the money-making power of his patent-pending software to uncover the biggest, fastest profit opportunities in the cryptocurrency markets. If you’re a Cryptocurrency Windfalls subscriber, click here to login. If not, see below for more information about Cryptocurrency Windfalls. Hey, guys, Tom here with an urgent buy alert. I’m actually jumping on a plane in just a couple of hours. But I wanted to make sure that you all got this while there’s still time to make the biggest gains. Now, I’m sure you’ve heard a lot about Bitcoin and other cryptocurrencies in the news lately. But what you may not know is that my team and I have been developing a set of proprietary tools to help you get those 5,000%, 10,000%, even 35,000% gains that you keep hearing about. Our system has been tracking five different cryptocurrencies for the last week. And just this morning, I decided to make it official and give my first recommendation to buy. Because based on what my system is spotting, I think we have the potential for a 5,000%-10,000% winner on our hands. In a few minutes, I’m going to give you the name of that cryptocurrency. You’re going to watch me trade it live on this screen. But, before I do that, I want to make one thing clear. We built these tools using the exact same technology that we’ve been using for years to recommend options trades in the stock market. And in 2017 – when the S&P 500 returned 19% – our technology and analysis let me deliver 70 triple-digit winners. Don’t get me wrong. 19% return is phenomenal – that’s a great year in the market. But to give you some perspective, when you take all 70 of those trades, counting the partial close outs equally, you could walk away with a total, winning return of 8,452%. That’s 445 times better than 19%. 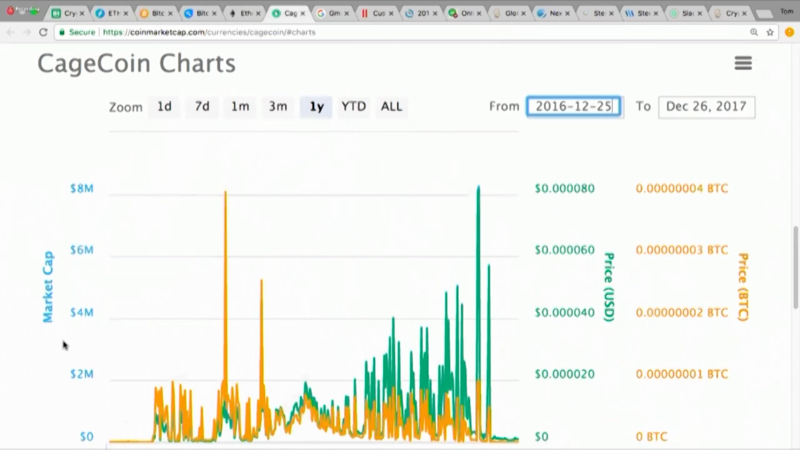 Now we’re using that technology to analyze the cryptocurrency market – which grew by 3,086% last year. So the question is: Can I multiply that 3,000% by 445? If I can, that turns every $100 you invest into $1,373,270. Now, that sounds like an insane number. Obviously most trades aren’t going to turn $100 into $1.3 million. In just the few hours of their searching, they found 79 different trades with extraordinary returns. And out of the 79 different trades, 40 returned more than 5,000%. All of these trades were found without the help of any of our proprietary tools. 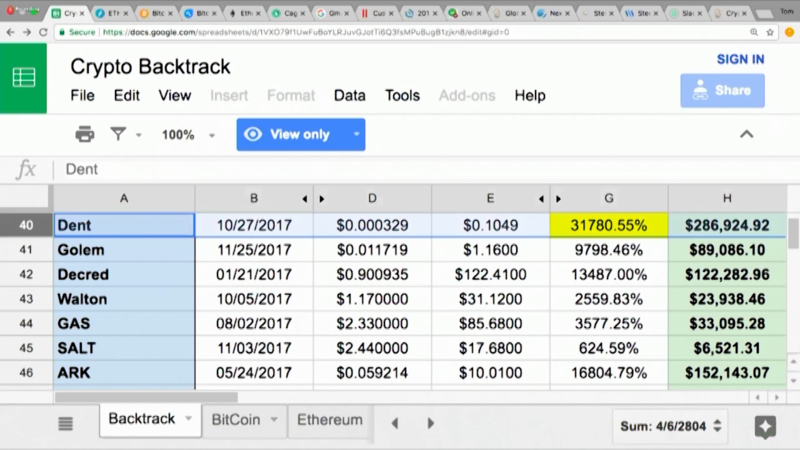 They found these with just a spreadsheet, a calculator, and a few of the basic trading patterns that anyone can look for. Just on their own, no help, no fancy tools, they looked back and found 79 different trades that made the kinds of gains that you could never see in the stock market. So imagine what could happen if you apply our proprietary systems that did 445 times better than the S&P 500 to a market with those kinds of returns. I’ll show you exactly how our system works in a minute. I’ll walk you through the tools. And I’ll explain how we use what I call an “inside man” to verify that it’s not some glitch, or market error, or pump-and-dump scheme by some kid in Arizona. That it’s a real asset that could help me find those 5,000%-10,000% percent gains. And have a real shot at those 50,000% and 100,000% gains. Plus I’m going to show you exactly how we’re planning to use this system to find 20 different 1,000%-10,000% winners this year. In other words, we’re going to use this system to try and turn a bunch of little $900 investments into a portfolio of somewhere between $180,000 and $1.8 million in the next 12 months. And if you want to hear more about the system, if you want to learn how you could do that 20 times this year – or if you just need help trading cryptocurrencies, keep watching. We’re going to cover all of it – from what a Bitcoin is, to how we’re predicting that this brand new system could find dozens of 1,000%+ winners this year. I’m going to move pretty quickly so bear with me for a minute as we dig into exactly what a Bitcoin is for people who don’t know, and head on from there. Cryptocurrencies – like Bitcoin – are digital assets. They are exactly like gold or silver which are physical assets – but they are generated by incredibly complex computer programs instead of being pulled out of the ground. And just like with gold and silver, there are really only three ways to make money with cryptocurrencies. You can mine them – which means running the programs that make Bitcoin and the other cryptos work on your computer in exchange for tiny rewards – like one-one thousandth of a Bitcoin – generated by the program. You can buy them and hold them – hoping the value just keeps going up. Or you can trade them. Mine, hold, and trade. That’s it. Everybody who has ever made money in cryptocurrency is doing one of those three things. Now when I got started with Bitcoin in 2013, I was a miner. If you don’t know what a miner is, don’t worry about. It’s hard to explain and harder to understand. But, basically I bought a refrigerator-sized computer and set it up in my garage running the program that supports Bitcoin 24 hours a day. And in return for that, I’d be awarded tiny fractions of a Bitcoin every couple of days. But this thing was huge – it took up most of my garage – and it threw off so much heat that when it was 70° outside, it was 100°-105° degrees inside my garage. It was miserable, and eventually my wife made me get rid of it – but not before I’d mined several Bitcoins. Now, if you look at the price of Bitcoin – those are worth just over $8,600 a piece today. If I were to sell them today, I’d do very well. Which sounds great. There are so many big companies running super-efficient server farms to mine Bitcoin out there that it’s almost impossible for a normal person to make money mining. In fact, I was reading the other day – let me see if I can find the article. One second, guys. 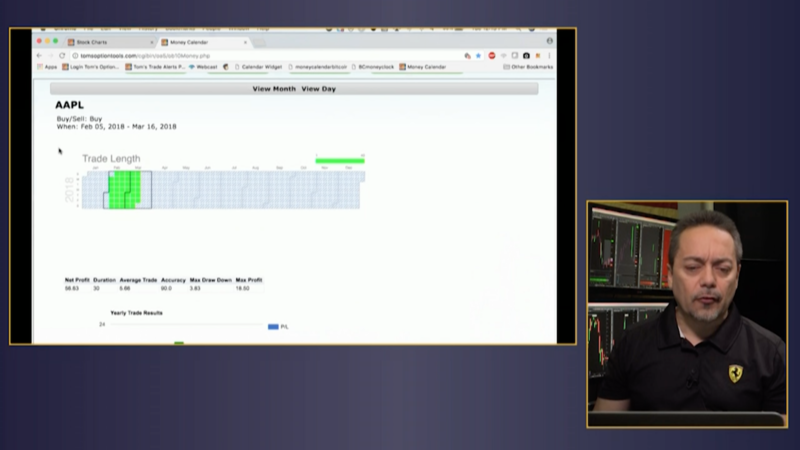 According to Finder.com, if you’re using CPU/GPU/FPGA to mine – basically any kind of computer – it’s even possible to run from your house – as of November 2017, you get so little Bitcoin when you mine that you actually lose money once you’ve paid for the electricity to run the computer. 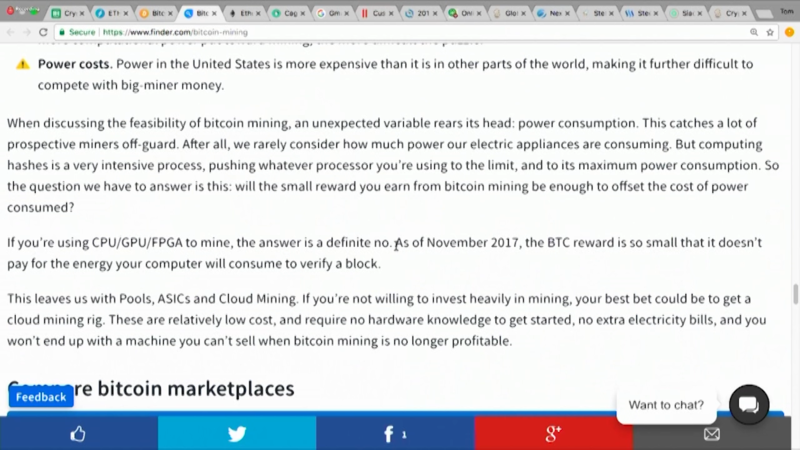 So mining is out as a way for most people to cash in on Bitcoin and other cryptocurrencies. That leaves buy-and-hold investing and trading. But let’s look at the price of Bitcoin and the other major cryptocurrencies for a second and you’ll see the problem. Let’s say you got in before this massive price spike we’ve seen over the past few years. Let’s say you got in here where my cursor is – October 2015. Bitcoin was trading around $244. Now, if you bought and held until today, that’s great. You can see Bitcoin’s trading at $8,652. But let’s jump over here and look at the math real quick. You can see I’ve got the numbers plugged into this sheet right here. $244 to $8,652 gives you basically a 3,400% return. And look, you can see it right here. 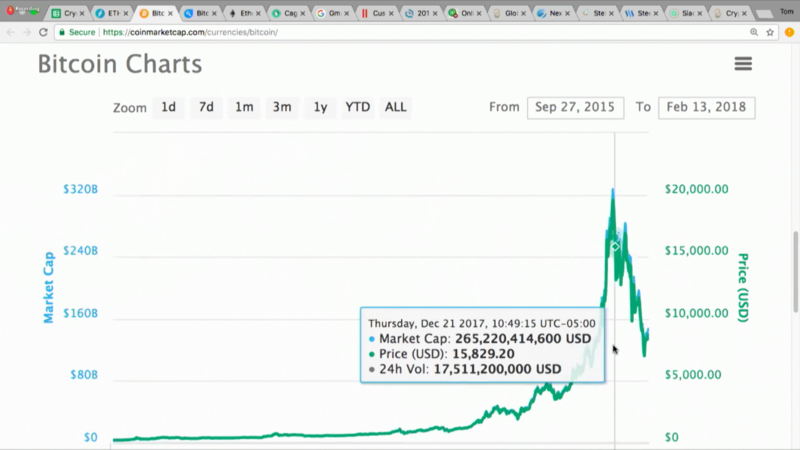 That’s incredible – and it only gets even more insane if you look at other major crypto-coins like Ethereum. Let’s say you bought Ethereum in early 2016 when it was trading for about a dollar. $1,000 becomes more than $848,000. Now that’s incredible – but have you spotted the problem? Bitcoin and Ethereum are probably still great buy-and-hold investments at today’s prices. You might double, or even triple your money over the next two to three years. 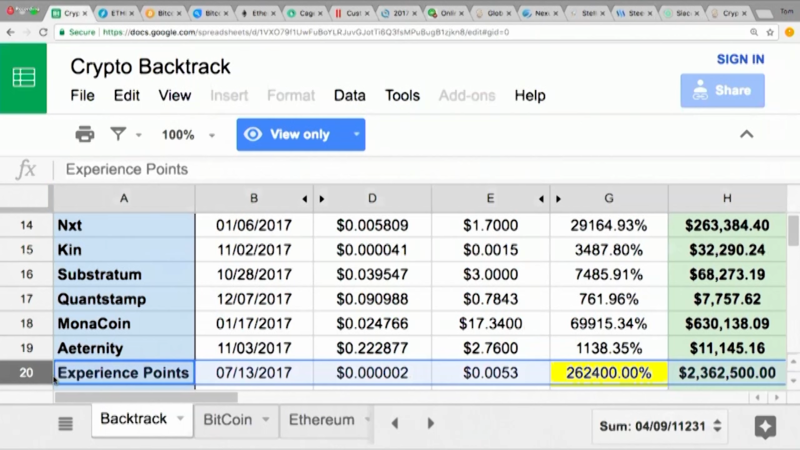 But are they going to the $100,000, $200,000+ per coin we’d need to hit our goal of 20 different 1,000%-10,000% winners in the next year? What you probably get is stuff like this we’ve seen over the last few weeks. You buy here at almost $17,000. Then a couple weeks later you’re down here and you’ve lost 40% – almost half your money. So buy-and-hold is out. Those 10,000% days are behind us for the major cryptocurrencies like Bitcoin, and there’s a lot of risk. 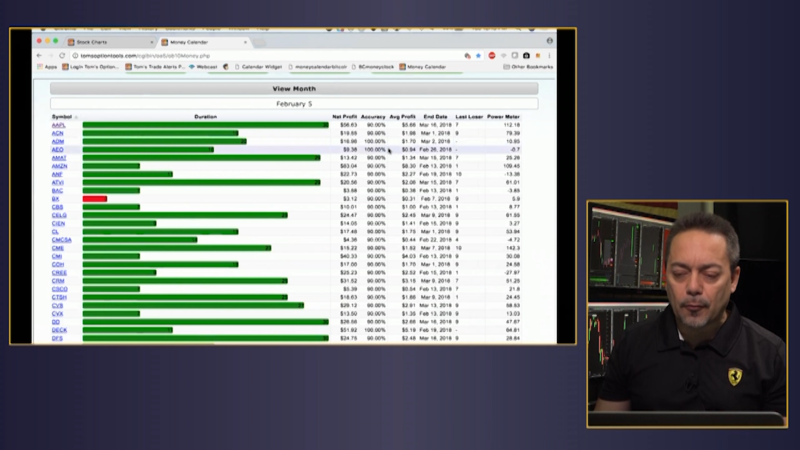 Mining doesn’t work anymore. Remember – you actually lose money mining these days. So how are we going to turn $900 per trade into a potential $180,000 or even $1,800,000 this year? If you want to do that, you’ve got to be trading cryptocurrencies. That means watching patterns to see what’s going up and what’s going down so you can get in and out quickly. Not holding these coins for years, but getting in and out in just a few months, or even a few weeks, to lock in those gains. And you’ve got to be watching more than just the really big cryptocurrencies like Bitcoin. 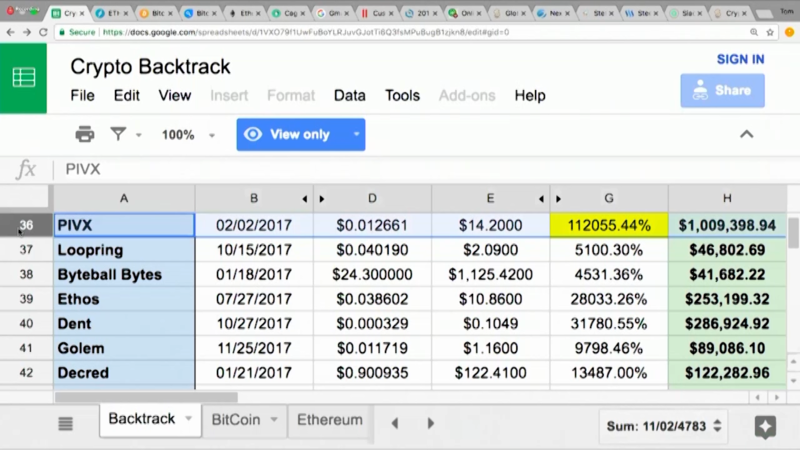 You’ve got to be looking at all of the smaller alternative cryptocurrencies – called Alt-coins – if you want to turn $1,000 into $200,000 – or $100 into $1,000,000. And this only really works if you’re trading them – buy-and-hold is way too dangerous in a market like this. I’m not saying that there’s no risk trading them, but I’ve been watching these Alt-coins for a while now. Let me show you the kinds of gains that are possible in this market. 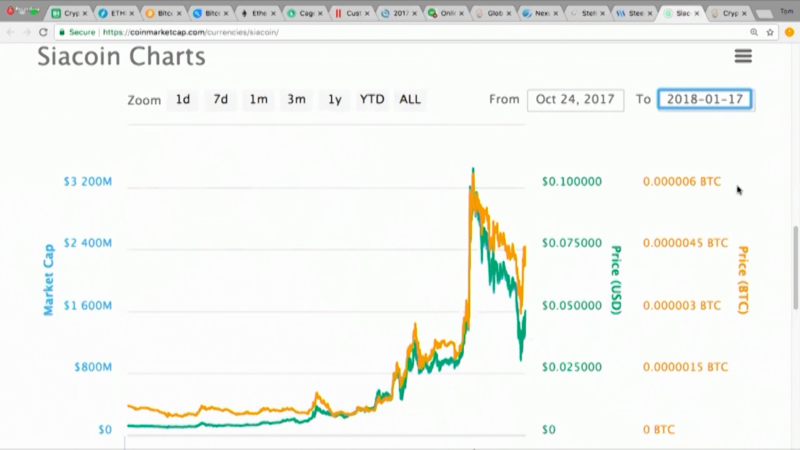 This chart shows the one-year price on a smaller Alt-coin called CageCoin. 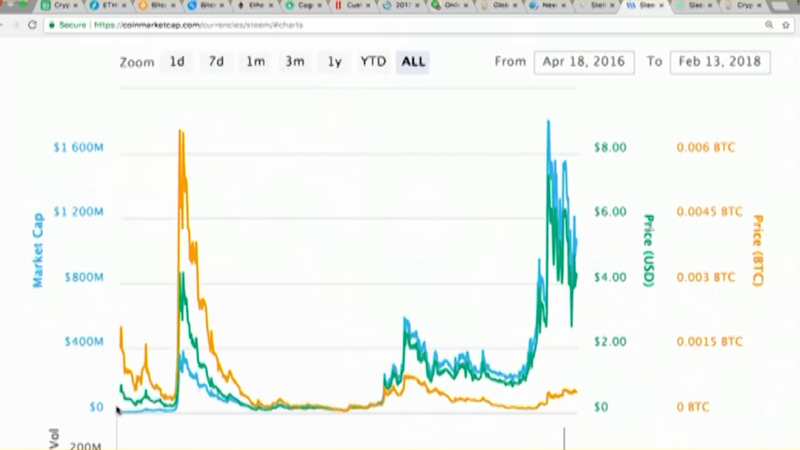 This orange line shows the price relative to Bitcoin. This green line shows it relative to the U.S. dollar. First, look at the price of CageCoin in U.S. dollars. It is really, really cheap. The baseline here looks like it’s .0000002 dollars – that’s tiny fractions of a penny. So a $50-$100 investment means you own a lot of CageCoin. Probably tens of thousands, if not hundreds of thousands or millions of coins. I’m not doing that math right now. It’s not important to what we’re talking about. What matters is it’s trading for tiny amounts of money and anyone can get into it. Which is great, except who cares? I mean, you look at the beginning of this chart and you look at the end, and what do you see? The coin is basically worthless as a buy-and-hold investment. It starts out worth nothing, and it ends being worth nothing. But remember, we aren’t buy-and-hold investors, we’re interested in how we could trade these. And there’s a clear pattern here. Every couple of weeks this coin explodes for 24-48 hours. I’m talking about huge gains. Look here – the market cap is about $35,000. 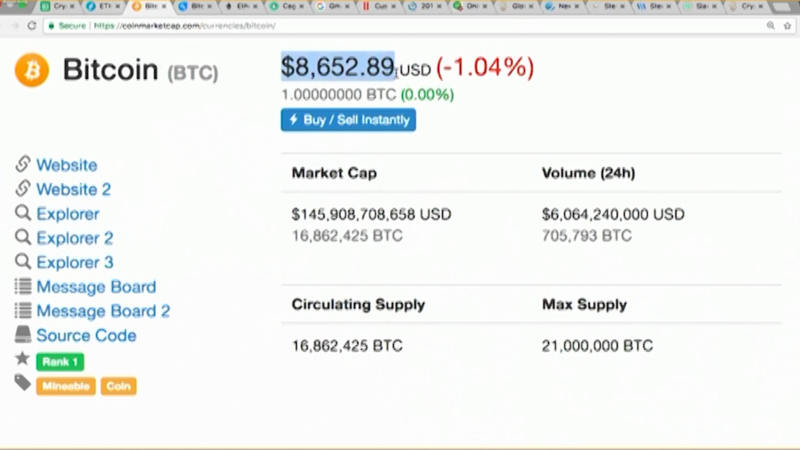 Now look here, just a few days later the market cap is $78,926,269. If we plug those numbers into a spreadsheet, that’s more than a 225,404% return. $500 turned into $1,127,520 in just a couple of weeks! And obviously that spike was way bigger than any of the other ones on this chart. But what if you could watch the patterns and figure out what triggers these price changes? Not just this giant one – but one of these smaller ones we see happening again and again? Do you see how $500 could become $1,000, $2,000, maybe even $5,000 or more – all within a couple of weeks. Now, what if you could predict that kind of change coming – not just for CageCoin – but for all the different cryptocurrencies? What would happen? •And BitTokens, up 7,700% in just two days. $900 into EACH of these trades would have left you sitting on $112,050. That’s a life-changing amount of money. And yet, it’s really happening. In fact, just a week or two ago, I was talking to one of the kids who works in my office about the kind of money people can make trading these Alt-coins. I wasn’t giving him trading advice. This was just the kind of watercooler chitchat you have at the start of a meeting before everybody is in the room. And that isn’t some tech genius or financial wizard. 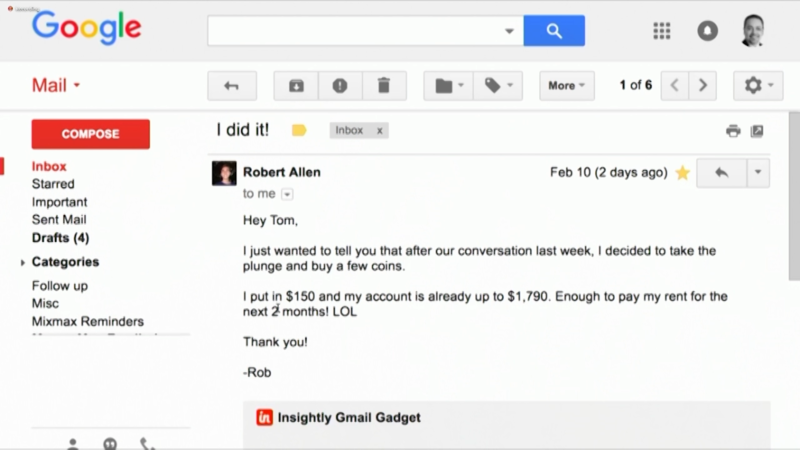 That’s a 25-year-old kid who writes the filler we throw into emails for a living – and in a couple of weeks he’s turned $150 into more than $1,500. Now, he got lucky. He clearly hit one of those upswings and got back out before it went down. But if you want to keep your gains – and if you want a chance to hit a goal like the one we set of at least 20 different 1,000-10,000% winners this year – you need more than luck. You see, cryptocurrencies are still a young, volatile market place. And no one can guarantee they’ll hit a goal like mine. It’s possible we’ll fail to hit those kinds of gains. But here’s what I have that, as far as I know, is unique in the world. First, I’ve got a system that can capture the tidal wave of data pouring out of the 24-hour crypto marketplaces. And second, I’ve created a proprietary program to automatically sort through that mountain of data, spot the patterns, and sort the wheat from the chaff. That way I can spend my time focusing on actionable trades, rather than sifting through charts 24 hours a day. It’s not a crystal ball, but it is an incredible advantage that I don’t think anyone else has. Let me show you how they work when you’re dealing stocks and options. Okay, so what you’re looking at here is one of our tools that we use in spotting these high-probability trades. And so this looks just like a calendar here. If you look closely, I can dial into a day and each day is going to show me opportunities… which opportunities are bullish and what opportunities are bearish. Now, these are based on a minimum of 10 years of backtesting and 10 years of patterns. So we’re talking about millions and millions of data bits. For instance, recently, we looked at February 5 and Apple came up as an example. Now, Apple was a 30-day trade and as you can see here, I’m looking at everything from net profit to its accuracy – if you know, some of these have 100% accuracy going back 10 years. But also average profit, I’m looking at end dates, and then I’m going in and looking at even more details, like the actual day to buy and the actual day to sell. And more detailed information even looking at the patterns, to visualize whether this pattern is getting better and better and better this year. From there, what I do is, I then handpick that trade for a minimum of a 100% return, but often much, much more. Now, if you think this is cool in stocks and in options, with cryptocurrencies… you haven’t seen anything yet. You can see how powerful these are right? And in fact, we have a system for tracking – not just our technical results – but the actual gains our subscribers have made trading our options recommendations. I want to show you some of the results they’ve shared with us from using my other services this last year. Roger Blake’s total profit on these two trades was just over $7,000. The top 15 people alone made over $256,000. And the list just keeps going on and on. We have literally hundreds more stories like these. And remember this is all trading options in a year where the market as a whole returned just about 19%. Now, we’re talking about using the same kinds of tools over here. Last January, the market cap on cryptocurrencies was $17,129,300,000. A year later it’s $828,573,000,000. Now, if we can multiply the S&P by 445 times, just think of what we can do with a 4,700% gain. Because remember, we’re looking at this as traders, not buy-and-hold investors. And when you’re trading all you care about is price movements and patterns. The same systems work whether you’re trading stocks, or gold, or bread, or cryptocurrencies. All you care about is price and pattern. And that’s exactly what our tools are designed to track. Now remember, this chart might look a little confusing. But just pay attention to the green line. It shows the price relative to the U.S. dollar. Just looking at the chart, we can see there’s a very clear pattern of price spikes followed by big pull backs. Let’s say you knew what was coming and you’d gotten in here where Nexus is trading at below $1. But look what happens very quickly – in just a matter of weeks. Then through the 9th, it hovers between $11.50 and $13.00. Now, I’m not saying that you get lucky and catch this peak over here and sell for the one hour where it was above $15. But you’ve got days over here where it’s hovering around $12. If you could say with confidence that a pricing surge was coming, you’ve got plenty of time to buy in November when it’s around $1. And you’ve got plenty of time to sell in January when it’s around $12. That’s something like a 1,100% return in less than two months. That’d unheard of in stocks, but when it comes to cryptocurrency that’s actually pretty common. Let’s say you buy in early November at 2.6 cents. Put in $900 when it is trading around 2.6 cents. And look, you can see as I move my cursor, some days it’s cheaper than that 2.6 cents, some days it’s more, but we had a pretty good chunk of time where you could get in right about 2.6 cents a coin. By December 19, the price is already up to 29 cents a coin. You can see, it peaked at about 90 to 91 cents. But let’s be honest – no one is going to sprint back to the computer to close the trade. So you end up selling out right here, a couple of hours later at 86 cents a coin. Again – I’m not saying you have to buy the coins at the absolute lowest point and sell at the very peak of the high. You’d be sitting on over 3,000% gains. So look here – in one trade your $900 could have given you nearly $30,000 profit. That’s not bad for one trade – that probably would have taken you a total of two minutes to execute. Now of course there’s risk trading in a market like this. It’s volatile, you can always lose money. And there are dozens of charlatans out there who are just looking to cash in at your expense. So what you have to remember is what matters when you’re trading. You’ve got to know patterns and you’ve got to have the data on price. And no one else has all the data like we do. There aren’t any other tools on the market for sorting the price data, and turning that avalanche of information into actionable trading ideas. That’s what you need to avoid the scams. That’s how you could potentially get rich. 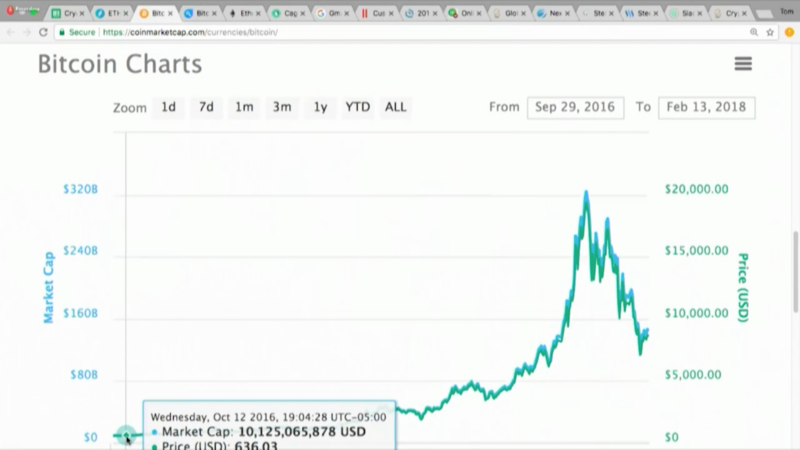 Looking at the chart, you can see there’s been some huge run ups and pull backs – and the pattern is pretty obvious. We don’t need the computer to show it to us this time. 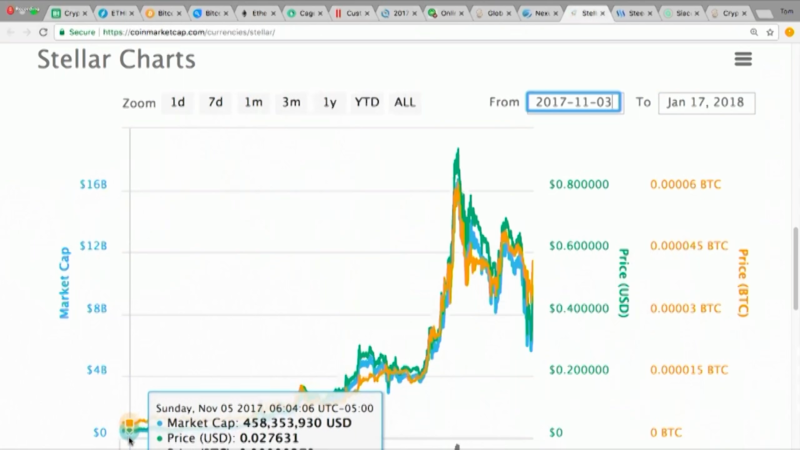 We see the price spike then bottom out. 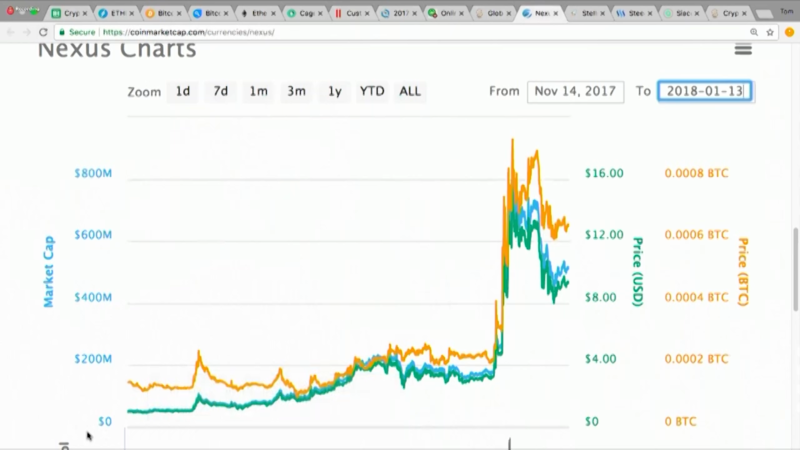 The price spikes then bottoms out. Now we see this huge spike in July 2016. And we’re bottomed out at 7 cents a coin in March 2017. You know what’s going to happen next. I know what is going to happen next. Even without a computer, this pattern is clear. It shoots and bottoms out. We see that again and again. You’ve got the pattern, you can see the price. So if you were lucky enough to find this one tiny coin, out of the 1,300 on the market, then put $750 in at 7 cents a coin. Steem is up to $2.43 in June. Up to $3.43 on December 24. Then it shoots higher $7.31 on January 3. What if you’d bought in late October… early November. You put in $900 when it is trading around $.003 or $0.004. 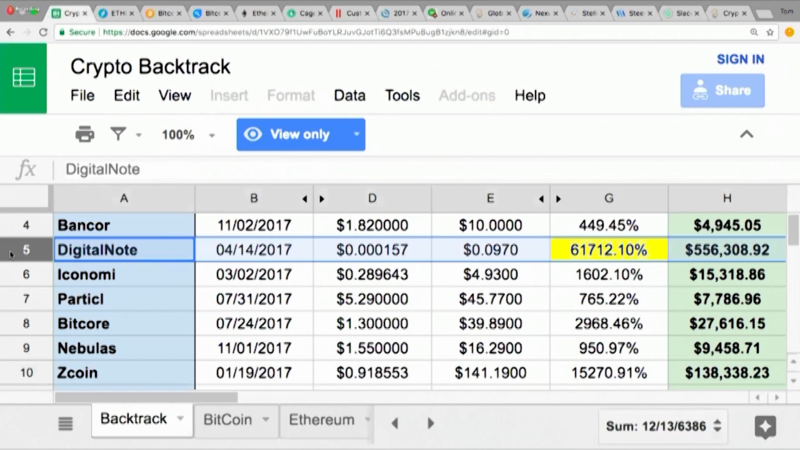 By December 25, you’re already up 10x to $0.03 a coin – your $900 is worth well over $9,000. But let’s say you don’t sell until January 7. You can see, it peaked at about 8 to 9 cents. And you get out. So in one trade your $900 became $20,250. Those are the kinds of trades we’re going for this year. In fact, I’m going to be making one of these trades LIVE every week, for the next year. That’s 52 trades in total. And like I said earlier, my goal is for 20 of those trades to return 1,000%-10,000%. That’s enough to potentially turn a few $900 trades into between $180,000 and $1,800,000. And the list just keeps going – we backtracked 79 of these things before calling it quits. Obviously, you can’t only find winners, and some of these trades didn’t do 10,000%. But look at this return. If you’d put just $900 into each of these you’d have $12 – nearly $13 million. But let’s say you had three total losers for every winner. Pretend for each trade on this spreadsheet you made three where you put in $900 and lost every penny. In other words, let’s add 237 trades where you lose money. That seems pretty generous, right? Like we’re not being insane, we’re working in a significant loss rate. So you make a total $12,837,429.80 on your winners. Okay, so you lose $213,300 on those bad trades. That means you made almost $13,000,000 and you lost just over $200,000 over the course of a year. You’ve still made over $12.6 million in a year! That’s extraordinary. I’ll take those kinds of returns every time. So when we say we’re looking to make small investments and come out of 2018 with up to $1.8 million – we’re not shooting for the moon because even a fraction of these gains would be life-changing. In a second, I’m going to make the first trade – live on this screen. Then I’ll show you how to follow along with me on each and every trade recommendation for the rest of the year so that you can reap the rewards of our hard work. Because it’s not magic. We’re leveraging a powerful, patent-pending computer system that I’ve developed and refined over the years. You’ve got to remember, there are over 1,300 different coins out there. And more are coming out every day. 90-95% of these tiny coins are total B.S. They’re just ideas or concepts. But there’s nothing behind them. So what you have to do is you have to sift through all 1,300 of these things to find out if there’s any intrinsic value to the companies behind the coins. Like, for instance, Bitcoin is great because it was the foundational coin. It’s got its own brand. All right. Then you’ve got Ethereum, which has a company behind it that actually brings blockchain technology to corporations. Therefore, that is going to flourish. Litecoin is kind of like Bitcoin. It was one of the early adopters, people like it too. But for most of the rest of these things, it’s the Wild West. Most of them are garbage. You can’t just blindly follow a trading pattern in that kind of market. If you do, you’re going to get burned by a computer error, or lawsuits that freezes the coin you’re up $10,000 on, or a pump-and-dump scheme run by some kid in Arizona. You need something to give you an edge over everybody else – an “inside man” that really understands what’s going on to help you steer away from the landmines lurking out in this field. I’ve been studying cryptocurrency since I started mining them in 2013 – and I’ve been a computer guy my whole career. I built the computer system Home Depot uses to stock its stores back in the ’80s. What it did was look at the previous year’s sales for everything they stocked – lawnmowers, hammers, air filters, whatever – and tell store managers exactly how many of each item they would need to keep in stock to meet demand without buying more than they could sell. Then I built a financial technology company that I eventually sold to Charles Schwab for $20 million. I understand technology. I’ve been building pattern recognition systems for more than 30 years. And the extra analysis that lets me do it is really the lynchpin of our system. Because you have to have that kind of insider understanding if you’re going to trade in this market. If you don’t have someone in the know to give you the nod that a trade is sound, it’s just too dangerous. That’s why I want to let you watch every trade I make this year – live and in real-time. And it’s what makes ETHLend – the coin we’re about to trade – so valuable. In just a second, I’m going to put $900 into ETHLend. And at today’s prices, we’re planning for that to turn into more than $44,000. But first, let’s talk a little bit about what I dug up on ETHLend that makes it such a promising trade. ETHLend runs a peer-to-peer lending network on the blockchain. So it’s running a real business, acting kind of like a bank, facilitating loans. And just like with a bank, when people take out a loan, they put up collateral – maybe their car, or $500, or whatever. And then ETHLend holds that collateral against the loan – so the ETHLend coin has that intrinsic value beyond just the technical indicators we see. That’s a really strong protection for someone like you or me that wants to trade ETHLend. So let’s go ahead and make the trade. I’ll be investing real money in this trade – but for me, the important thing here is showing you how to do this for yourself, not making a quick buck. So any profits I make from this trade I’ll be giving to charity. I’ve got ETHLend pulled up. That’s its ticker symbol there, LEND. But if you want to get in and it’s gone up a little bit when you buy in, don’t worry. 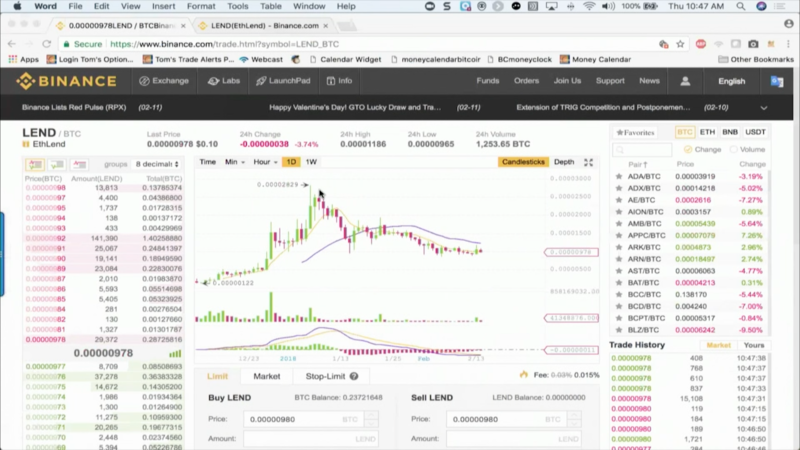 My buy-up-to price on ETHLend is actually 20 cents. So anything below that and you’re still good on this trade. Remember, we’ve got a $5 price target on ETHLend – so even at $.20 the potential is enormous. By the way – I always recommend buy-up-to prices for these small coins, and you need to follow them. It’s important because it helps you minimize risk. And these small coins can move pretty fast. So if you’re interested in getting in, don’t spend three weeks thinking about. So here’s how you make the trade. As you can see here, I’m going to place a market order for ETHLend. Now, this trades off Bitcoin so you don’t see the U.S. dollar price here. But looking up at the price here LEND is at 10 cents. And don’t worry, if you don’t have an account like this. When you sign up I’ll show you how to get Bitcoin to trade with and create an account on an exchange like this. It’s easy – you’ll spend less than an hour getting set up. 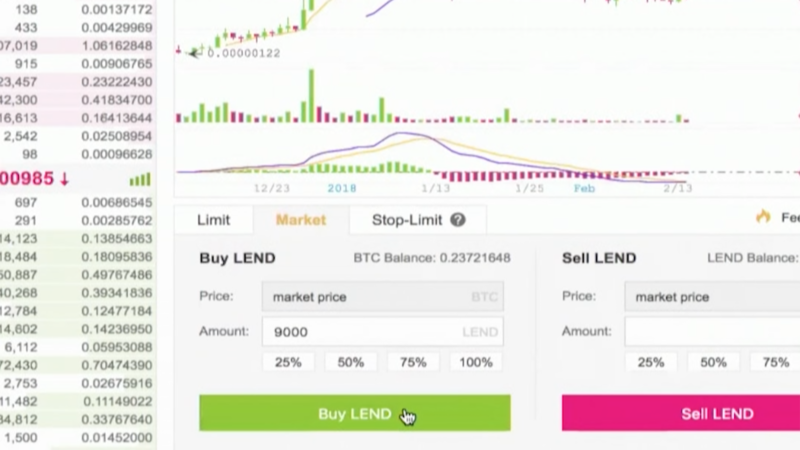 Anyway we want to invest $900 in LEND. It’s trading at around 10 cents so I get about 10 ethlend for the dollar. So if I want to invest $900, I need to buy 9000 Ethlend. And all I have to do is go right here to the market order box, type in 9000, and hit purchase. We’ll be tracking the trading pattern closely over the next few weeks – just to make sure the price target holds up. But if we’re right about where the price is going, we should be able to ride this for a $43,200 in profit over the next few months. And like I said before, that’s just one of the 52 trades we’ll be making over the next year. If you want to trade alongside me – in real-time, every week – let me tell you about Cryptocurrency Windfalls. This is a brand new research service I’m launching this year with my partners at Money Map Press. You can actually watch over my shoulder as I put in real money right alongside you. I’ll show you exactly how to trade them. You’ll also instantly get access to my six-week insider boot camp. You’ll have the first lesson almost from the moment you join. Because if you remember our trade from a second ago, you can’t just take out a credit card, or pull money out of your bank account to buy these little Alt-coins that will make up a lot of our recommendations. You’ve got to have either Bitcoin or Ethereum to trade on the exchanges. That’s why you’re getting your first boot camp lesson right away. I’ll walk you through the entire process of setting up your Bitcoin wallet, buying your first Bitcoin to trade with, getting an account on an exchange, and using the exchanges to trade Bitcoin and Ethereum for these Alt-coins. It’s all easy to do. You could be ready to make your first trade in just under an hour. 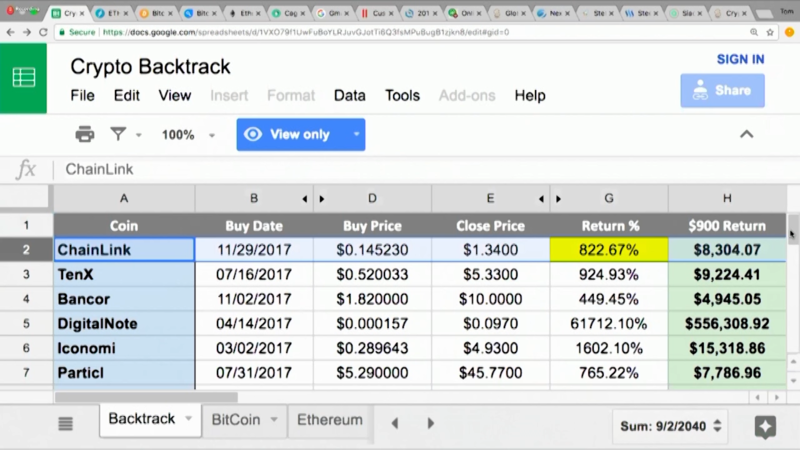 In the second module, I’ll show you exactly how I think about cryptocurrency, and the system I use to find lower-risk, high-reward trades. 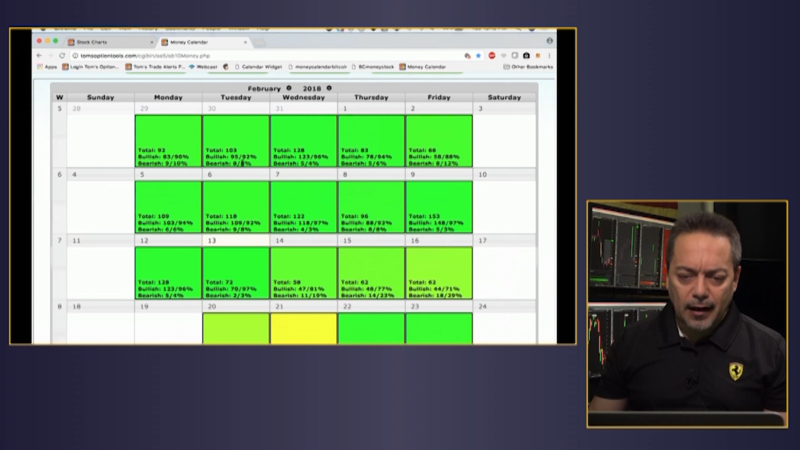 And in the third module, I’ll show you some of the key trading patterns I have the computer look for to help me make our trade recommendations. Plus, as part of the boot camp, I’ll host three special, video Q&A sessions where I’ll answer any questions you have and make sure you’re totally comfortable with the crypto market, our strategies, and how the system works. Basically I’ll be showing you how to spot the best alt-coins on your own. So you can trade these coins on your own and go ahead and execute double- and triple-digit wins without me holding your hand. Because once you see the profit potential of these trades, I don’t think you’ll want to wait for me or limit yourself to one a week. Don’t get me wrong – we have software unlike anything that’s available on the market and a team of researchers working to find these opportunities for you – day and night. But if you’re serious about this, you should probably learn how to trade these coins on your own. Because it’s a bad idea to blindly follow someone’s advice, especially when your money is on the line. That’s why I’m showing you how to spot these patterns and trade these coins on your own… in your spare time… without needing my analysis or recommendations. That’s also why I’m taking part in a live, in-person event later this year and inviting the first 150 people to sign up. I want to give you real-time access to me… and really dig into how you trade these coins. I can’t give any personalized advice, but I want to really dig into the strategy we use to trade cryptocurrencies. The place I’m looking at renting only holds about 150 people. So that’s the limit. And the only fair way I can think of to divvy up the limited number of seats we have available is first-come-first served. So the 150 people to order will get a free ticket to the event to attend in person, with us. But don’t worry, if you’re not able to get one of those tickets. We’ll live stream the event to everybody who signs up. Plus, we’ll take frequently asked questions in real-time from our attendees and anyone watching online. So even if you aren’t there, you’ll still have a chance to participate. But if you want to be there in person, you’ve got to act now because the only fair way for me to hand out the live tickets is first-come, first-served. Now, my partners at Money Map value our six-week training course at $5,000. 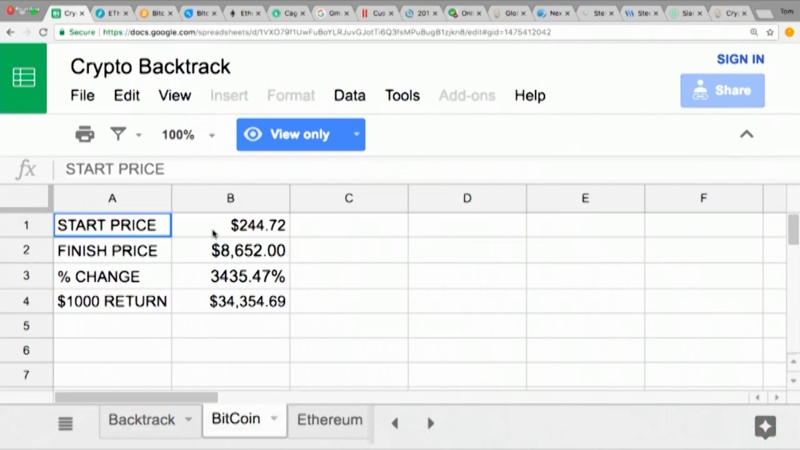 Plus, another $5,000 for the weekly live trade recommendations and analysis. That’s more than a $20,000 value for everything in this offer. But honestly, I don’t want to charge you that kind of money. I want this to be something that anyone can get into. Because for me this isn’t about money. Helping people create real wealth for themselves and their families is my passion. That’s why I’m giving 100% of the profits I make from these weekly trades – every penny – to charity. This includes the massive windfall I’m projecting for my ETHLend trade. Neither I nor my publishers at Money Map are lining our pockets with these trades. If we make $1.8 million that’s $1.8 million for charity. See, I’m tired of watching people slave away at their jobs year after year while settling for 3% or 4% or 10% returns on their savings. Wall Street has fed us the lie that that’s as good as we can do. And it’s simply not true. Last year I showed thousands of people how they could have done 445 times better than the S&P 500 in a year where normal market returns were great. You’ve already seen the results we’ve got from real people. Conventional wisdom says that’s almost impossible… that you should be happy with one tenth of that. But I’m here to tell you that you don’t have to settle. Look at some of these returns cryptocurrencies saw last year. Those kinds of gains could make someone hundreds of thousands… Maybe even millions of dollars. Just because at least 79 different coins could have given you those kinds of returns last year, doesn’t mean you’ll find the same this year. Especially if you were to try on your own. That’s why you need our system behind you. That’s why you need our research, our recommendations and our tools. Because I think cryptocurrencies are going to change people’s lives and make millionaires in 2018. And I want you to have a shot at that. I think you deserve that. So I’m setting the price as low as they’ll let me. Which is why you’re not going to pay $20,000 for this package. You’re going to pay just $5,000 for access to my live weekly trading sessions. That’s as low as my partners can afford to go. I believe that the ETHLend trade we just made has the potential profit of more than $40,000. Let’s say we don’t hit that $40,000. Let’s say we do 1/10th of that. That’s $4,000. Which means we can miss our target by 90% and you’ve still nearly doubled the money you’ve spent on this entire package. And that’s just one trade – that I already gave you for free. We’ve got 52 more coming. And remember – we want 20 of those to return 1,000% or more. So that’s a potential $180,000 to $1.8 million for you, and because I’m giving all of our profits from these 52 trades to charity – another $180,000 to $1.8 million for other people and causes that desperately need it. That’s what I think we could see this year from our trade recommendations. Oh, and that reminds me: You saw our examples – you know these markets move fast. So what happens if you miss one of my live online trading sessions – or you want to think about it for a few days before jumping in? How do you know if the coin is still a good deal or it’s still a trade I’d recommend? Don’t worry, we’ve got you covered. First off, we’ll always record our trading sessions, and send you an email with that video and our written analysis. That way you can watch it at your leisure. My team has also created a Daily Crypto Update that you’ll get every afternoon. You’ll get the latest headlines and big news from the crypto markets – plus exactly what they mean for us. And we’ll keep a running scoreboard of our last four to five trade recommendations. You’ll be able to see at a glance if it’s still a buy, or if you should be holding it, or if it’s time to get out. I’ll also send you my Weekly Watchlist early every week. Because for every green light buy signal we get, we’re closely watching four to five different coins. But these markets move fast, and if you want to get into these trades, the live trading sessions aren’t the time to start your due diligence. You need to have already done that before jumping on the live stream. The Weekly Watchlist is there to give you anything you need to do that research on your own. That way, if you invest, you don’t have to choose between feeling comfortable and maximizing your profits when I give you the buy signal. You’ll be getting the Daily Debrief and the Weekly Watchlist on top of the $20,000 value we’ve already given you. Weekly Live trades where I’ll be investing real money for charity. The six-week insider boot camp including our three-part Q&A video series. Two-day live, in-person or online, mastermind event where I’ll host a special cryptocurrency workshop. The Daily Debrief with everything you need to know about what’s happening in the markets. My partners at Money Map can’t afford to leave this offer for long at this price. And I need to be fair to them, too. So they’ve agreed to honor the $5,000 price for anyone who joins BEFORE my live online trading session next Thursday, February 22. But the second that stream goes live – this offer is off the table. So if you’re ready to get started, the time is now. A button should have just popped up at the bottom of this page. If you’re ready, you can just click on it to be taken to our secure subscription form. Simply fill that out and you’ll have your first training video – and if you’re one of the first 150 people, you’ll also secure your ticket to our two-day event..
Now, I’ve only got a few minutes before I have to leave to for my flight. This offer is only for people who are committed to learning how to make as much as $100,000 to $1,000,000 this year. We don’t want tire-kickers who aren’t interested in learning how to use this strategy with us and aren’t being serious about the recommendations. Those people aren’t going to become successful. So there’s no trial period, and no refunds. If it’s right for you, you know it and you’re ready to commit. But right before this call, I spoke with the publisher at Money Map. His name is Mike and he’s a great guy. Now, you remember that my goal for this year is to give you 20 trades that return between 1,000% and 10,000%. But Mike said an empty promise doesn’t cut it. So he’s actually going to guarantee that anyone who signs up BEFORE our first trading session next Thursday, the 22nd, gets the chance to see those 20 1,000%+ winners within the next year. And if you don’t, he’ll eat the cost out of his own pocket and buy you a second year of the research service for free. That’s just the kind of guy he is. And that’s how confident he is in what we’re doing. And our two-day, live event where I’ll be teaching a live workshop. Plus if we don’t hit our goal of 20 1,000%+ winners, Mike is giving you a second year for free. So if you’re ready to join us – ready to potentially turn $900 investments into $1,800,000 – just click on the button below this video. Make the ETHLend trade if you want and come back to join Cryptocurrency Windfalls when you’re ready. You just have to decide if you’re willing to risk losing a few thousand dollars if we’re wrong… or risk losing a million dollars if we’re right. But whatever you decide, you have do it soon. If you’re ready and you want an honest shot at making $1,000,000 this year, just click on the button below. I’ve got to run – I’m already 10 minutes past when I needed to leave for the airport. I can’t wait for you to join us and I’ll see you next Thursday on our first live trading session. You’ve got to say that trading is risky, past performance doesn’t guarantee future results. You’ve got to say it again, using those exact words. Okay… alright. I’m being told to remind you that trading is risky, and past performance is no guarantee of future results. And that’s true. It’s possible that, regardless of our track record in the options market, regardless of our industry leading proprietary software. Regardless of the hundreds of people who have written to us talking about the kinds of gains they’ve made from our options recommendations, that we’ll be wrong 100% of the time, or 50% of the time, or 10% of the time. I’m only aiming at 20. Because we’ll be wrong some of the time. That’s why I would never recommend you put more than $800 or $900 dollars into any one of these trades. Because there’s risk. There’s a chance that any one of these trades could go to zero. I can’t guarantee that doesn’t happen once or twice. But’s let be honest here. Nothing is guaranteed – living is a risky business. There’s a risk that you’ll be in an accident every time you get in the car. And it’s not a little risk either. Cars kill twice as many people in the U.S. than guns every year. That happens, it’s a fact. Half of marriages end in divorce. Most jobs don’t work out in the long haul. And more small businesses fail than don’t. But that doesn’t mean we don’t get in the car, we don’t get married, create careers, and build a life. You deserve a life where you aren’t huddled in the corner afraid to do anything. I’m not saying you go crazy, stop wearing your seatbelt, and start juggling knives. But at some point you’ve got to choose the risk you take. Over the last couple of years, Bitcoin and other cryptocurrencies have made people millions of dollars. And everything I’ve seen leads me to believe it’s creating more millionaires in 2018. Are you going to play it safe? Are you just going to accept that this year will be just like last year? Are you going to accept that next January you’ll be no closer to your goals than you are today? OR are you going to decide to take a risk? Are you going to risk a little bit of money for the chance to change it all? Personally, I think you deserve to take that chance. I think you deserve a chance to retire in style – not when you’re 85 or 90 – but today. I think you deserve your piece of the millions of dollars I see people making this year trading cryptocurrencies. I think you owe it to yourself to seize this opportunity. And if you do, I’ll be right there alongside you. I’ll never recommend a trade that I’m not putting money into or where I’m not holding your hand. And I won’t be keeping a penny of those trading profits. I’m giving it all to charity because I’m willing to make that investment in you. Because I think you deserve all of it. If you agree then it’s time to act. Go ahead… click on the button below. Or, if you prefer to speak with someone over the phone, just call 1.855.509.6600 (1.443.353.4770 for international callers) and mention your Priority code: WCRYU228. Protected by copyright laws of the United States and international treaties. This Newsletter may only be used pursuant to the subscription agreement and any reproduction, copying, or redistribution (electronic or otherwise, including on the world wide web), in whole or in part, is strictly prohibited without the express written permission of Money Map Press, 1125 N. Charles Street, Baltimore MD 21201, USA.